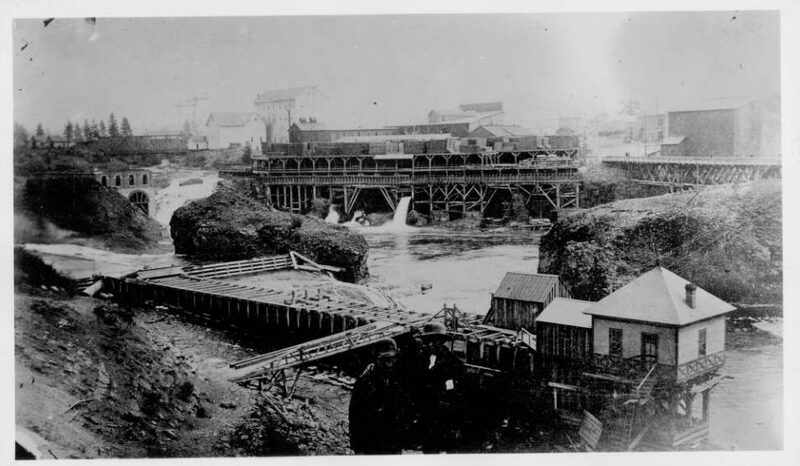 The Great Fire of 1889 decimated the quickly developing town of Spokane Falls. The areas near the river affected by the fire rebounded within a few years thanks to Dutch investors attracted to the growing city. Many of the industrial properties that established themselves during this decade would continue to operate and influence the area along the river for many decades to come. Although changes would continue to take place in future years, the blocks around the river had become established as a fully functioning community by the early years of the 1890s and depicted working class life in the 19th century. 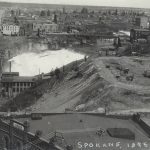 The Echo Roller Mills and the Spokane Oat Meal Company, both under new management—Bravinder and Keats, and Olney and Wadham respectively—acted as focal points of the industrial landscape of the area near the river. In 1892, a fire broke out in the factory of the Spokane Mill Company consuming all of the Echo Roller Mills as well as the Oat Meal Company. 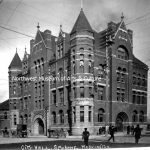 This fire also damaged the Spokane Steam Laundry, newly rebuilt after the Great Fire in 1889, and the nearby Howard Street Bridge. The aftermath of the 1892 fire, though not as devastating as the Great Fire of 1889, was a news worthy topic in papers across the nation. Fortunately, the affected mills and businesses were able to quickly rebuild and continue operations for at least another decade. 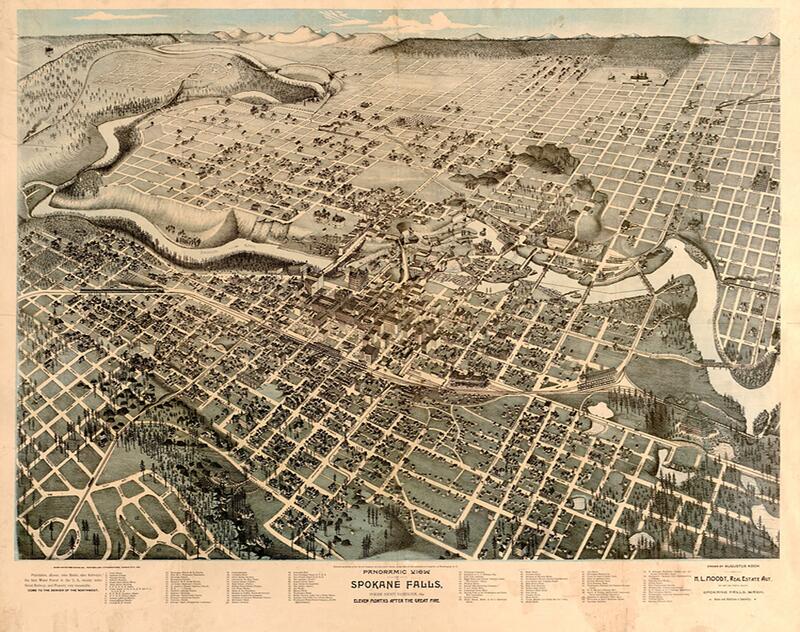 The early 1890s also saw an increased residential presence within the borders of Riverfront Park, diversifying an area that had been dominated by industrial operations for over a decade. Over 70 cabins or homes stood on Havermale Island as well as one hotel, the Svea, and a boarding house. 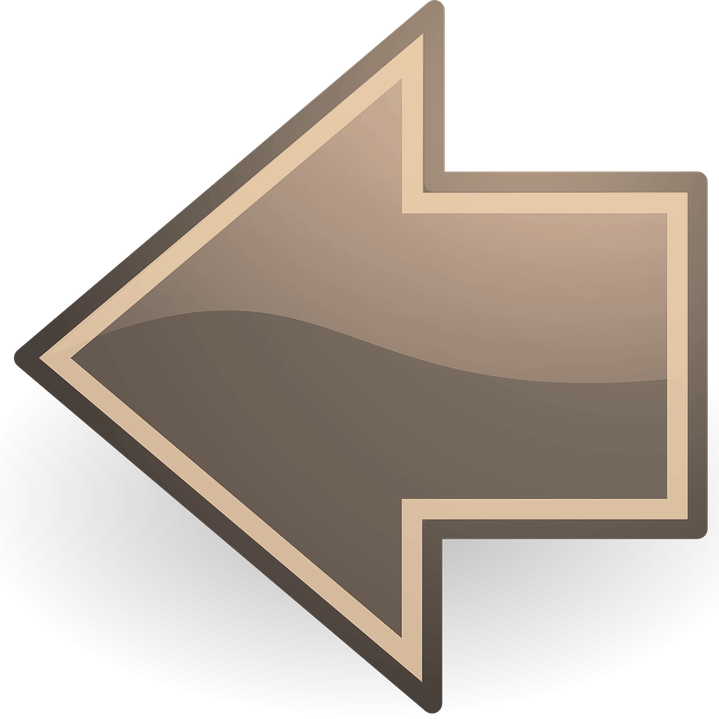 The population of Havermale Island, seventy-four people, was a mix of Spokane’s skilled and unskilled labor force and its middle class. The residents at this time continued to be primarily single men working in the nearby mills, factories, and shops. In 1892, occupants living in cabins along the southern edge of Havermale Island were forced to move elsewhere when the Great Northern Railway began constructing tracks along the shore. 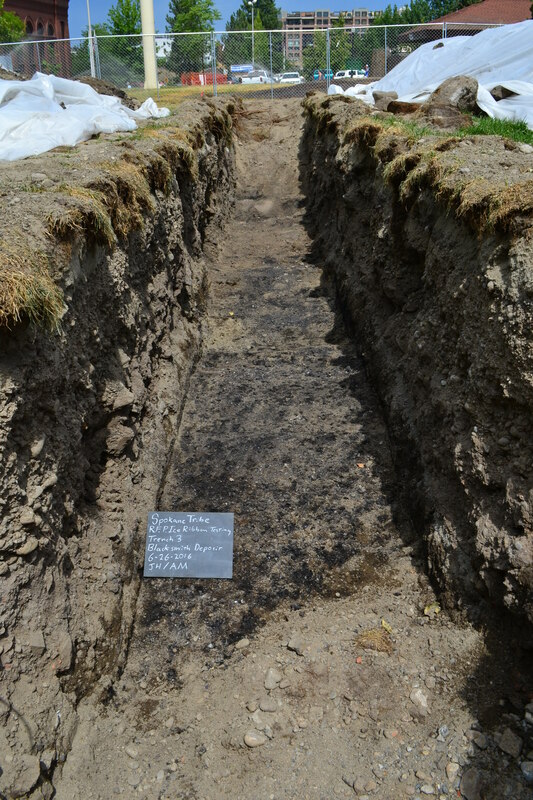 The skills and employment of the residents that remained in the area varied greatly. Representing this diversity, occupations included a lawyer, bookkeeper, newspaper pressmen, policeman, railroad employees, clerks, grocers, bartenders and tailors. Numerous residents were employed by nearby businesses. The few women living in the area included laundresses working at the Spokane Steam Laundry and nearby hotels. 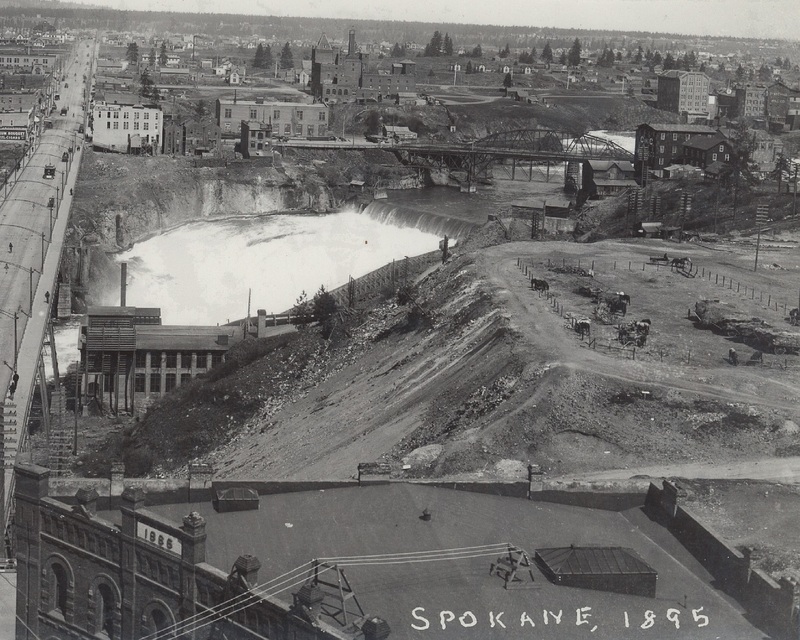 Carpenters, laborers, and engineers of the Spokane Mill Company, and a Spokane Shingle Mill teamster were also known to live in Riverfront Park area. The businesses contained in the 13 block area were just as varied as the people who owned and operated them. 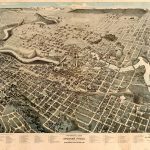 Commercial businesses including a carriage and wagon shop, the New York Brewery, a saloon, paper dealers, a plumbing service company, and a shop selling cigars, wine, and liquor continued to thrive in this growing area. 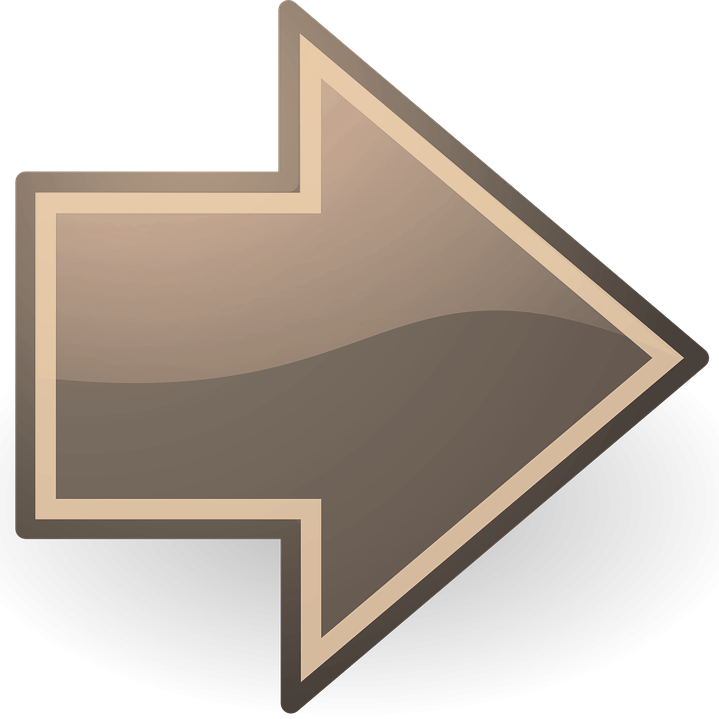 In addition to the commercial growth, the industrial landscape was evolving. New industries making an appearance in the area during the 1890s include the Island Manufacturing Shingle Mill Company on Havermale Island and the City Water Works located on “Little Island”, what is now known as Canada Island. 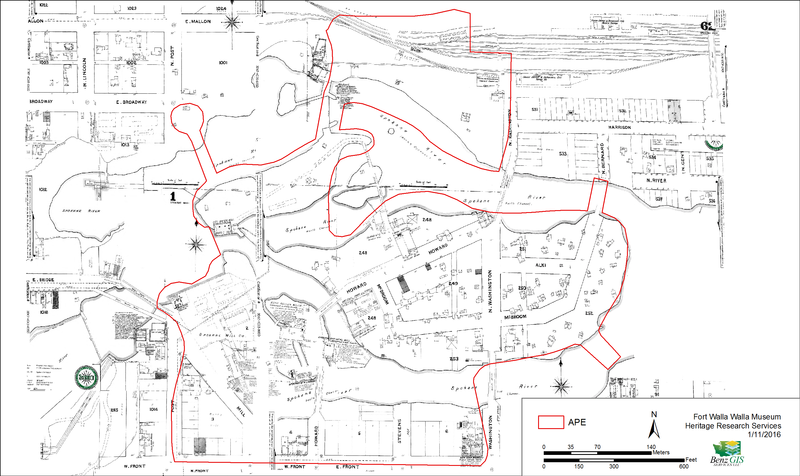 Following the completion of the report on the history of the Riverfront Park area, a physical inspection of the park began in the southwest corner which will soon house the new ice ribbon. 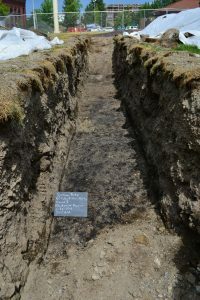 The physical inspection of the soil led to the discovery of an area that operated as a blacksmith shop before the arrival of the 20th century. 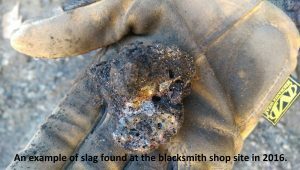 Located multiple feet beneath the grassy surface of Riverfront Park, ashy remnants of the hard work put forth in the 1890s were visible in addition to examples of slag, waste left over from metal working. 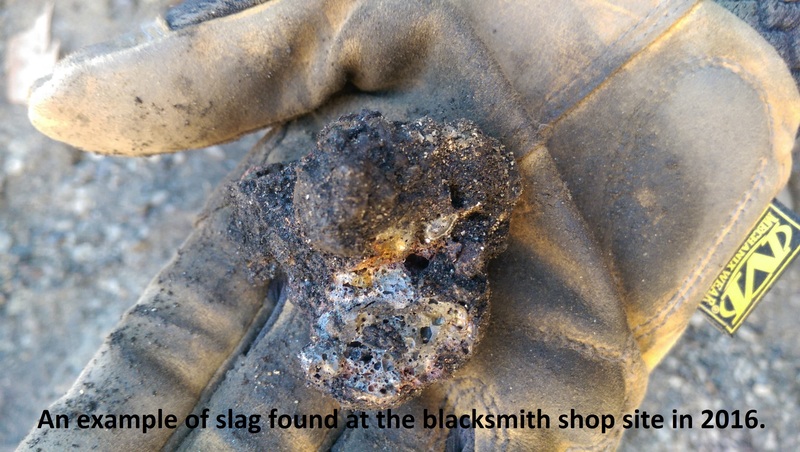 The archaeologists onsite are interpreting the feature as an open-air forge and/or space where spoils from the forge were dumped by the blacksmith. This site is placed in an area once covered by many sets of elevated railroad tracks as well as the large amount of fill dirt that was added during the construction of Expo ’74. Despite the many decades that have passed since the shop was operational and the changes that the location has experienced, evidence of the industrial past of the area remain buried beneath the surface. Further, we know who the blacksmith was that operated the business: Mr. Peter Sondgerath. 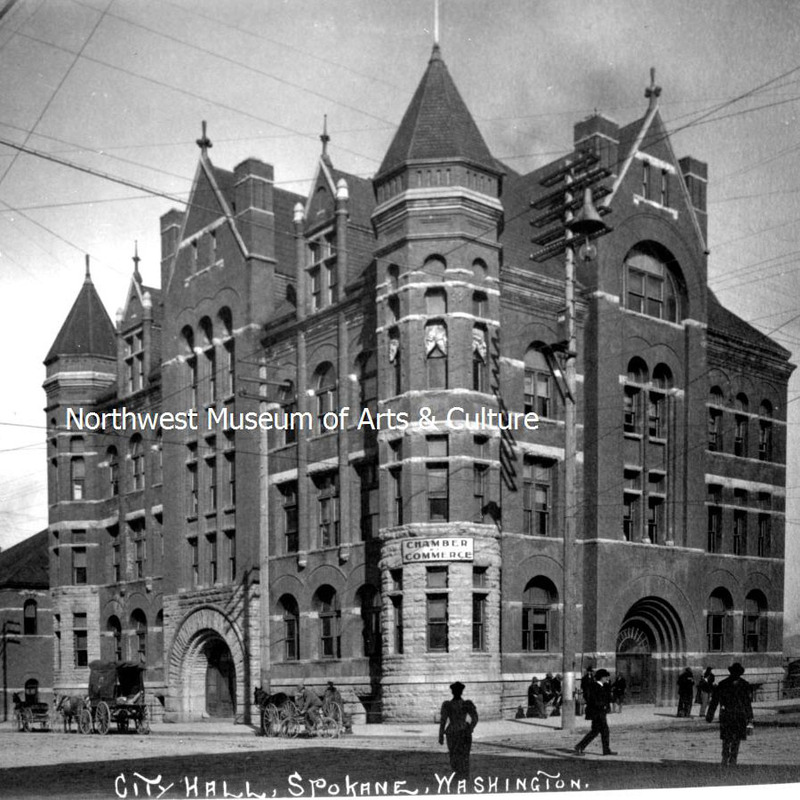 According to the 1900 Illustrated History of Spokane County, Mr. Sondgerath made the architectural framework for “Spokane’s principal buildings” including the Spokane County Courthouse. 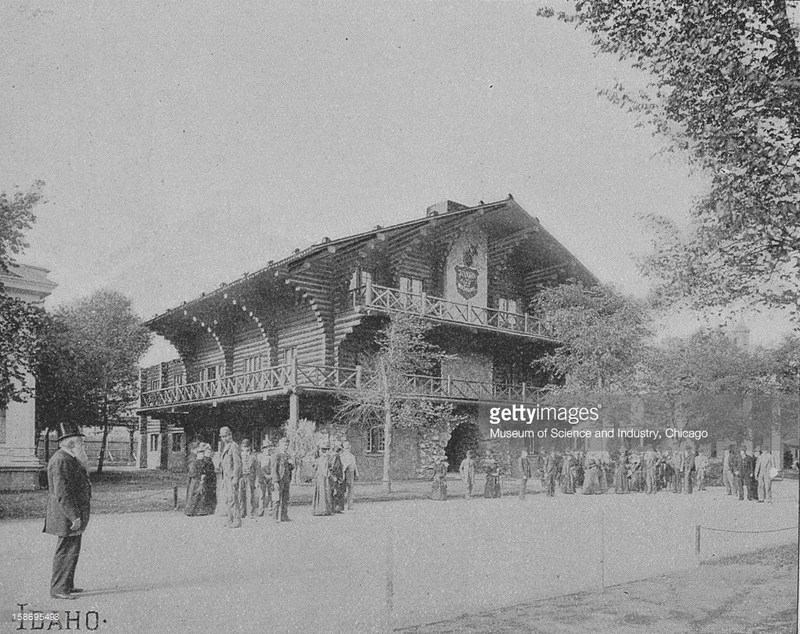 Ironically, he also has his own connection to a World’s Fair – he constructed the architectural ironwork for the Idaho State Building at the 1893 World’s Fair in Chicago which was designed by Spokane architect, Kirtland Cutter! The site of this discovery and the blacksmith shop that it originated from can be seen in the Sanborn Map below. The shop was located on block three, or the south west corner of the area outlined, on the 1891 Sanborn map.